“Weird to say, but since the first day, I can feel my board.” This quote of Lucas Puig sums up the newest pro model in the adidas skateboarding range, the Lucas Pro, pretty good. It’s well known that adidas doesn’t give out pro models to their riders easily. Quality over quantity seems to be the slogan within the Portland-based skateboarding offices. 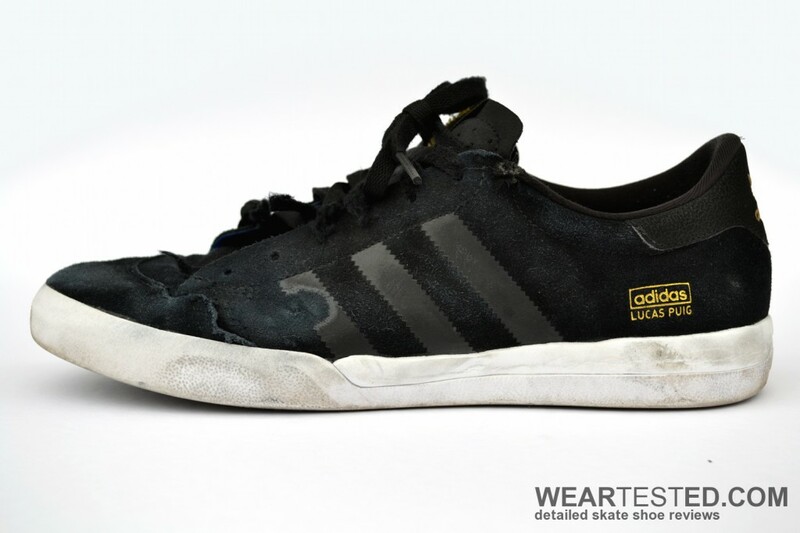 After being on Lakai for quite some years, delivering a – if not THE – stand out part in their video “Fully Flared”, Lucas Puig then switched to adidas in the beginning of 2011. The decision to bestow him one of those rare signature shoes was obviously a no-brainer, and only one and a half years later, it found its way into skate shops in July. Design-wise, the Lucas Pro is a pleasantly refreshing surprise. After years of simple and homogenous (if not boring) skate shoe designs, adidas took a leap again after the Busenitz Pro to come up with an original, heavily tennis-shoe-inspired silhouette that is indeed a signature style worthy of this description. Apart from displaying both Lucas’ and adidas’ French heritage, the Lucas Pro offers a few more internal sur­prises including “sprint skin”, a material that was also used in adidas’ Lionel Messi soccer boot, but more about that in the following review. The adidas Lucas Pro fits true to size. Contrary to the recent trend of one-piece toeboxes, the adidas Lucas Pro features quite a unique frontal area. From first glance, it seems it could lead to a decreased durability since additional layers on toe boxes often detach due to ripped seams from constant wear, which causes holes within the upper. However, due to a combination of the flat toe box and the large overlapping area where toe and side­wall panel meet, the durability of the upper soars far above average. A big contribu­tion is also delivered by the relatively thick and high side part of the sole, which is the main contact area between griptape and shoe and thereby disencumbering the more sensitive upper. Throughout the whole duration of the 10-hour test, the edge between the sole and upper did not wear down or develop grooves, a clear indication of strong durability. Unfortunately, the laces tend to rip through quite fast, which is the biggest flaw of the Lucas Pro regarding durability. On the other hand, the one-piece sidewall with only decorative stitching in the eyestay area contributes further to the overall great durability of the model, since it prevents unstitching. 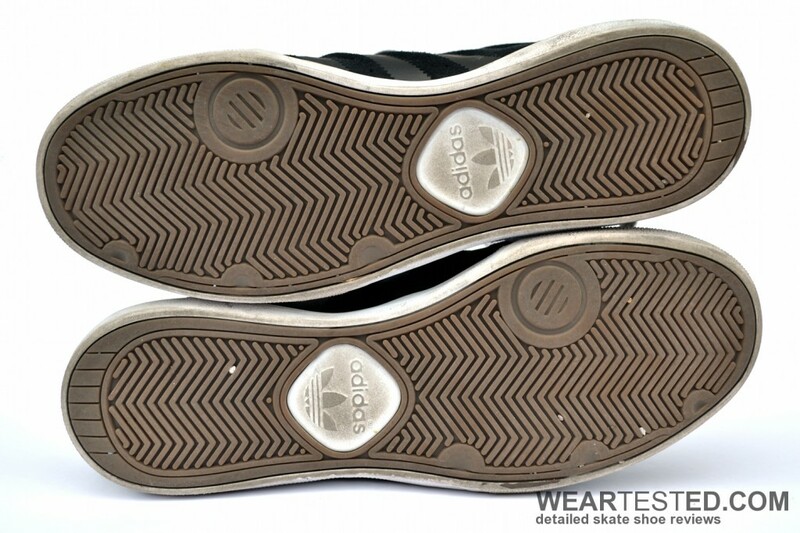 In addition, the fused on stripes prevent flaking of the trademark, a common flaw of other adidas models. 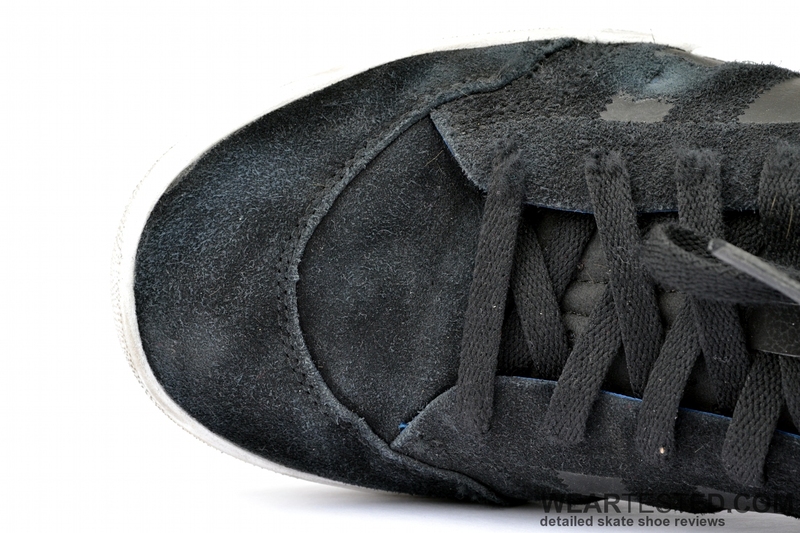 Furthermore, the bottom sole has proven to withstand griptape abuse quite well. It was able to provide excellent grip during the whole duration of the test. The adidas Lucas Pro is one of the slimmest and thinnest cupsole models on the market right now. Yet it still offers good cushioning due to the foam midsole. As can be seen in the cross section, the height difference between the front and heel has been pushed to the limit. The first third of the shoe doesn’t feature any foam, in the middle area it rapidly increases, and in the heel area it is up to 0.45 inches thick. This construction enables it to spread forces evenly throughout and absorb even tougher impacts that occur in the heel region. When bailing with impact to the forefoot, the contact is very direct and can be unpleasant, but it’s an unavoidable compromise in favor of outstanding board feel. The front third of the adidas Lucas Pro, which is the most crucial component for the optimized board feel, has been minimized to as thin as possible. Because of that thinness, the contact between feet and board is outstanding and narrows the space for improvement. The flexible sole unit contributes to this as well. At the same time, the foot is supported by the thick heel area to ensure a healthy balance between board­feel in the front and cushioning abilities in the heel. Over­all, the direction of the model is heavily focused on optimized board feel and only secondarily towards cushioning. One of the biggest advantages regarding heat development while skating the Lucas Pro is that the overall thin construction of the shoe refrains from heat isolation. Furthermore it features strategically placed ventilation holes between the stripes on the inwards-facing side, allowing an exchange of heat and cool air. With regard to the un-breathable “sprint skin” material, gaps placed in those areas enable airflow. Apart from that, the sprint skin assures that the side panels do not soak up moist and thereby allows the shoe to dry quicker when taking it off. The very thin and perforated tongue assures that heat development over the instep is avoided as much as possible. Contrary to popular belief, cupsole constructions don’t offer less grip than vulcanized constructions. The Lucas Pro is a prime example of a cupsole with outstanding grip comparable to any vulc model. The classic herringbone pattern is medium deep and turned out to be very durable. The highly flexible front area assures very good adoption to the concave shape and thereby maximum surface contact. The common decrease of grippyness due to wear was not experienced during the 10 hour test and the sole should be able to provide great grip during the whole lifespan of the shoe. As mentioned above, the toebox of the Lucas Pro is different at first glance. The front panel, which is inspired by tennis silhouettes, is rather wide in the front third of the shoe compared to the heel area, but tapers fast to a well-rounded peak. It provides excellent flick and makes it easy to control flip tricks. Overall the shape is as close to the foot as possible with only minimal padding, very much unlike classic cupsoles. It makes it a successful mix of a silhouette typically found with vulc models and a cupsole construction. The Lucas Pro is ready out of the box and probably has the shortest break in time a cupsole ever had. The overall slim and very thin construction comes at a small price though, which is sacrifice of comfort to a certain degree. The laces are noticeable due to the thin tongue, especially when the shoe is laced tight. In addition, there’s stitching in the front, as a result of the toebox design, that is not entirely flat and needs some time to get used to at first. Apart from that, the Lucas Pro is pleasant to wear because of its soft and straight away worn-in feeling. 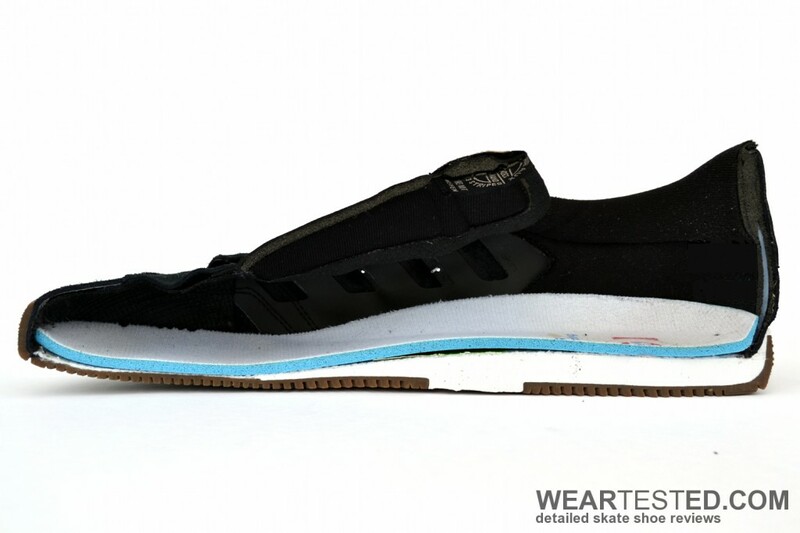 It is extremely light for a skate shoe due to the minimal use of heavy rubber. In the front where abrasion resistance and traction is needed, it features the high rubber outsole. Towards the heel, major parts of the sole consist of foam, which is a lot lighter and reduces the overall weight of the shoe. The sprint skin material that is used in the interior parts of the sidewalls, causes a snug fit and makes the thin construction possible by replacing otherwise needed material layers. 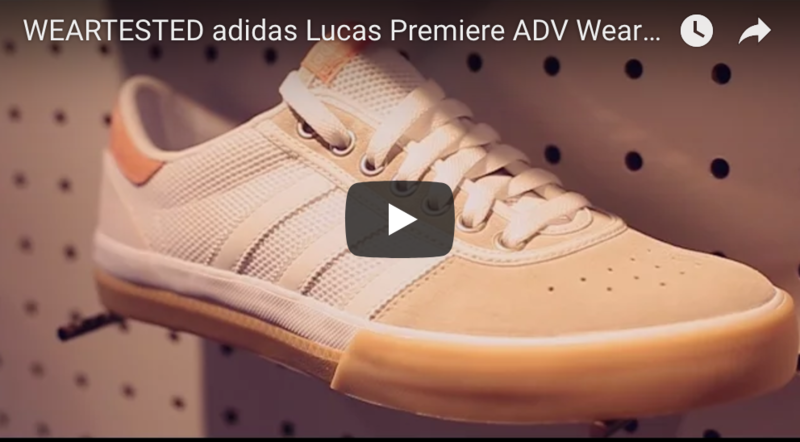 It is one of the main reasons why the Lucas Pro offers a natural worn-in feeling without allowing the shoe to stretch out with wear, which is a big advantage in the long run. Regarding support, a benefit of Lucas Puig’s adidas pro model is the rigid and big plastic heel reinforcement that assures a relatively sturdy heel area, even if it’s very thin. The low cut offers a high degree of freedom for ankle movement though, which partly relativizes this. Therefore it is mainly suitable for people who are not attaching high importance to offered stability, but instead are seeking for a model that does not limit the foot too much. One of the biggest advantages of the aforementioned sprint skin is the decrease of stretching out. Although the sidewalls are thin, the shoe stays in shape and supports the foot as much as possible. Overall, the support the Lucas Pro can offer is more comparable to a vulc model than to a classic cupsole. This can be especially advantageous for people who want to switch from vulcanized to a cupsole construction, but want an in-between model to help avoid a complete “culture shock”. The adidas Lucas Pro is a very thin and reduced to the minimum cupsole that feels like a vulcanized construction. It features good cushioning combined with outstanding grip, board­feel and far above average durability while weighing as light as possible. Follow us on facebook, twitter or @weartested on Instagram for weekly news, behind-the-scenes content, exclusive previews and pictures.